Hibiscus is much more common than you’d think in everyday food – it’s apparently the main component of red zinger tea, and is used commonly in other berry-flavored tea. With good reason – hibiscus’s flavor is a wonderfully tart cran-raspberry-like flavor. Well gee...I guess that's ok. I got my hands on a pound of dried hibiscus petals and, since hibiscus is most commonly used like tea, I decided to try a panna cotta with them. There was, however, a factor I didn’t consider. Hibiscus is naturally really high in pectin, and I guess the gelatin and fat in the cream was lighter than the pectin-y hibiscus, so I ended up with two layers. 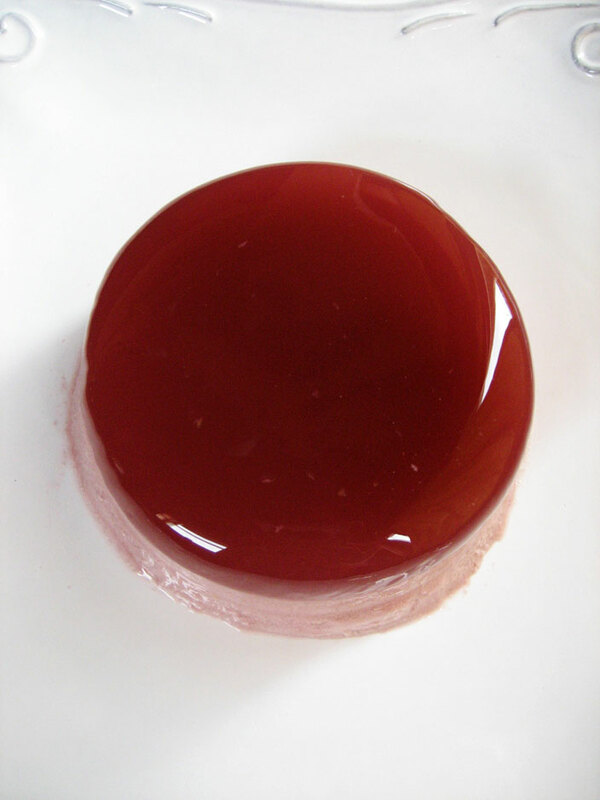 When inverted onto a plate, the top is a clear, tangy jelly, while the base is very rich and creamy. I couldn't say *CHOMP* because it's more of a slurpy food than a chompy food. If I had some hibiscus in syrup I’d add a flower to each panna cotta and drizzle some syrup, or, if I had candied hibiscus, chop some up and sprinkle it over each one. But, all I could afford was the bag o’ dried bits, so…yeah. Pour the cream into a medium saucepan and sprinkle evenly with gelatin. Let sit 5 minutes. Place over low heat, stirring gently until the gelatin is fully dissolved. Add the milk, sugar, hibiscus and zest. Simmer over medium heat until the cream foams slightly (about 5 minutes), then remove from heat, cover and allow to steep 15-20 minutes. Strain and pour into mold(s) or ramekins. Place plastic wrap directly on the surface and refrigerate for at least 4 hours, until set but still jiggly. To unmold, dip the mold in hot water and flip onto a plate. If it’s stubborn (or your mold has a lip like my ramekins) you can run a sharp knife around the inside of the mold. 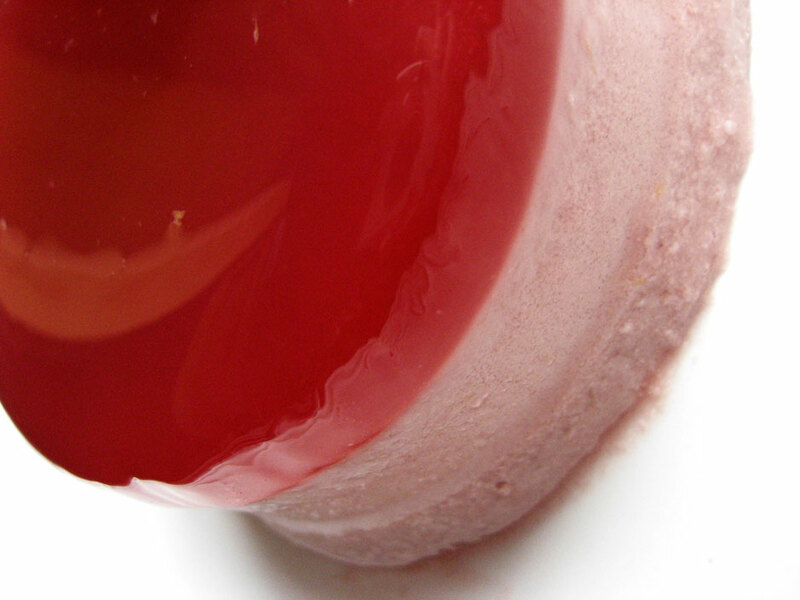 Allow panna cotta to slide out of the mold onto the plate. This is a very dramatic and tasty panna cotta. It looks cute flipped on a plate, or you could serve it straight out of the ramekins, with the bottom layer as a surprise. OR make it in fancy glasses, so you get an elegant presentation and you can see the layers. I think it’s pretty how it separated into two layers. That happened to me, too, once when I made matcha panna cotta. Even though I stirred the green tea powder well into the cream mixture, after they set up in the refrigerator, the panna cottas separated into two layers just like yours. I had a dark green layer and a mostly white, barely green layer, as well. But I think it was rather cool looking, so I liked the effect. 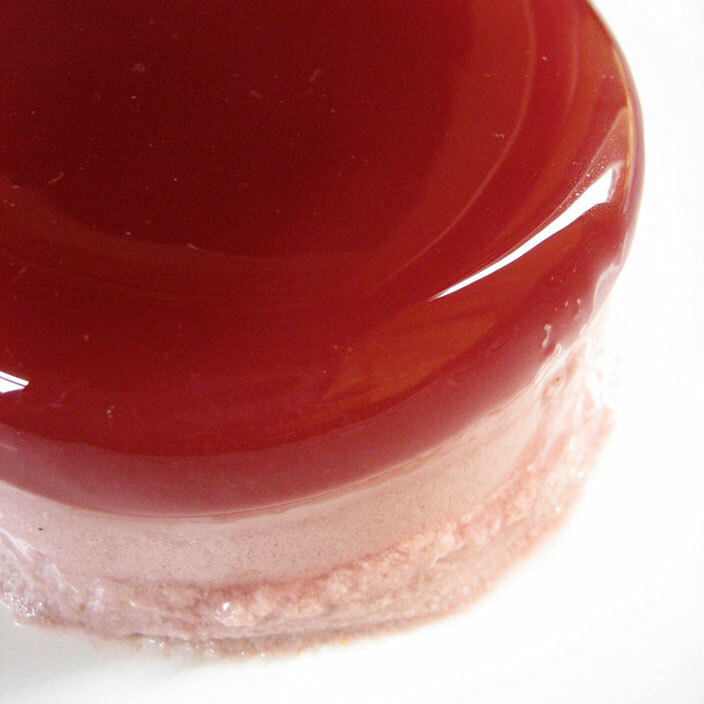 The colour looks amazing, and I didn’t know hibiscus was naturally high in pectin. How unusual that it separated like that! Your panna cotta looks amazing! I love the colors and layers! That looks amazing! Like it was meant to be :) Can I ask where you got hibiscus flowers from? They sound like a great ingredient! that looks really, really awesome to me…. Looks great! I’m actually going to try it tonight for a party I’m having on Saturday! Do you know how many this recipe makes? Dana, I was able to make 4 small-ish ramekins of panna cotta. It is so rich that one serving that way is very hard to finish on one’s own, though, so if you have very little ramekins you could use those for dainty servings. 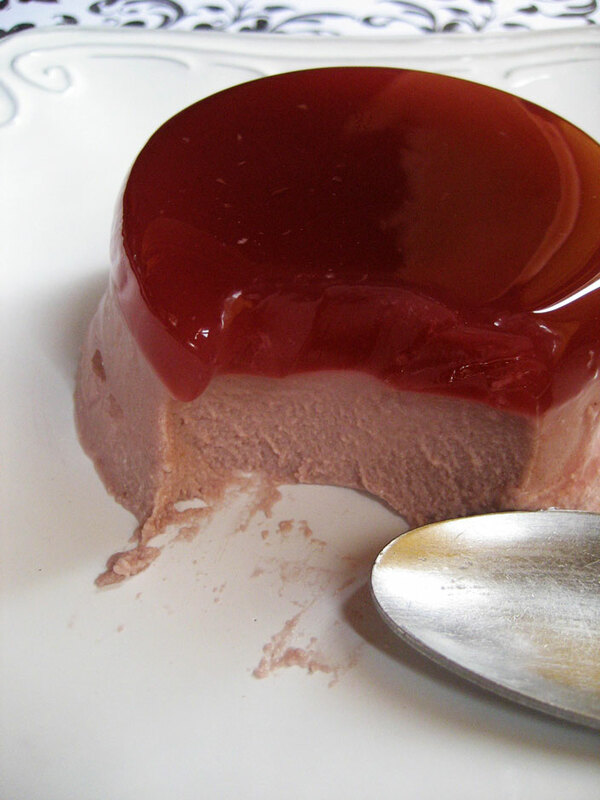 You could also use a medium-sized shaped mold and present the molded panna cotta, then cut servings. Lorraine, I bought the hibiscus from this eBay seller: http://stores.shop.ebay.com/Solar-rose-Organic-Teas-and-More__W0QQ_armrsZ1 It looks like many places that sell bulk loose-leaf teas also carry the flowers, though make sure you’re buying just the flowers and not a tea blend. Looks so yummy n im sure it is of cos. Loves the beautiful color. Izzit possible to use Fresh Hibiscus? I have got some from my grandpa. Do u happen to kno, if i need to do anything to it before using? Sum, fresh would also work, but keep in mind that flowers shrink a lot when dried so if you use fresh, you may have to up the amount. Oki doki Thanks for d tips n help:) Heehe here(singapore) I usually make some dessert with chrysanthemum or lotus or water lily. For gd health and very cooling to the body. Mmmmm these look really good. Have never made my own panna cotta before, I might have to give it a try! i must make this soon. hibiscus flowers are used in mexican cooking, mainly for agua de jamaica and it is really refreshing. they can be found in most mexican stores.